Over 20 years ago I acquired a stamped illustrated cover (a mailed envelope from Cuba to USA postmarked 1937) showing a sketched view of a Havana scene and with “Memogram” hand lettering above a sketched shield which contained “Canadian Pacific West Indies Cruise”. At that time, I just thought it was an attractive cover and put it away. About seven years later I acquired a postcard (see Figure 1: CP memogram postcard – Cairo Characters) with similar drawing style (i.e. 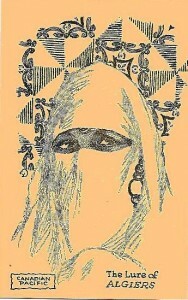 a black sketch on a mono-color background). 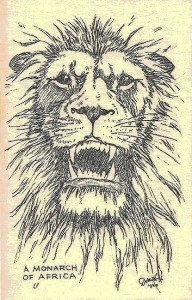 I knew this postcard had to be drawn by the same artist. But who was the artist? The only identifying mark was a capital ‘D’ in cursive with a small ‘F’ in the upper left part of the letter, presumably the artist’s initials. 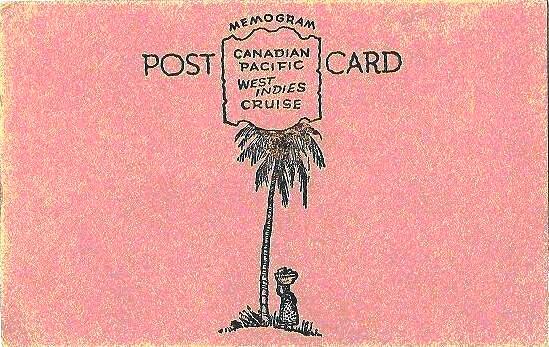 I knew them only from the text on the address side as “Canadian Pacific cruise memograms” and found the sketches of the local people and scenery very appealing. At this point I thought if I am going to start collecting more of these then I must learn more about them. How many different varieties are there? Is there a reference that lists the varieties? When were they issued? No printing publisher is denoted on the card. So how were they produced? Internet searches and inquiries to postcard dealers failed in finding any authoritative source on the artist or the postcards so I began my search for information. It took a little digging but once I had their names (yes there was more than one artist) I could find additional information on the internet. 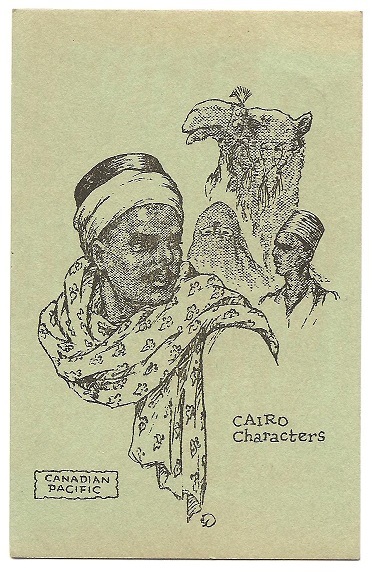 This article presents highlights of my findings to date, focusing on the major distinguishing features that make up the varieties of memogram postcards, the artists who drew them, and their production. Advertising it services to clients and investors helped promote the CP’s reputation as a global travel company. Advertisements and other promotional material produced for the CP can be found in newspapers and magazines, on posters, brochures, photographs, stationery, and postcards. 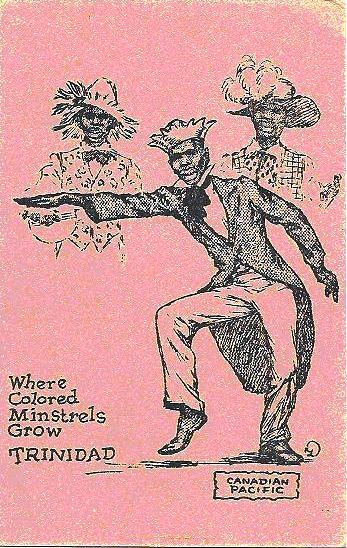 Many of these advertisements were beautifully illustrated. 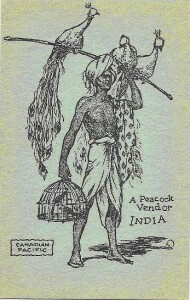 In addition to using photographers the CP often commissioned artists to depict the native people and scenery found along the many of the CP resorts or at far away ports of call. This form of advertisement continued up to the beginning of World War II, when traveling by ship became unsafe. However, during the heyday of travel by cruise ship artists and photographers provided the only medium to visually learn about these far away places. Flora Nash DeMuth and Martin DeMuth, a married couple, were two such artists who presented a unique style of not only portraying foreign sites of interest but the customs and dress of native people. They often accompanied their drawings (sketches) with textual humor. They were commissioned by the CP in 1926 and became part of the crew that lasted for 13 years. The DeMuth memograms are featured on both world cruises as well as the shorter cruises. 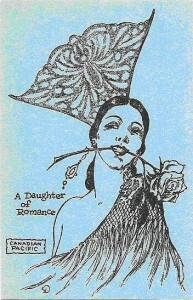 In addition to postcards, the DeMuths illustrated stationery and envelopes, as well as brochures for the Canadian Pacific. 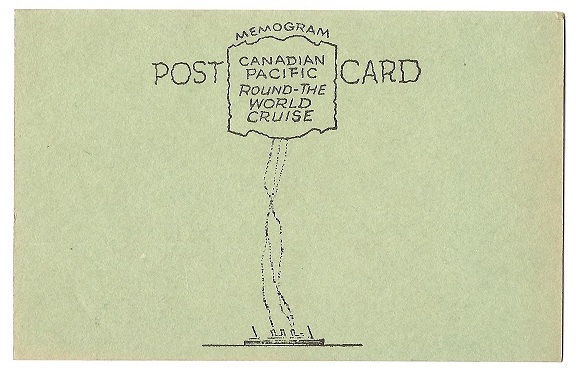 The term “memogram” was described by the DeMuths’ in one of their announcements from the 1936 Empress of Britain World Cruise. 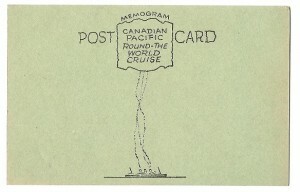 “An Exclusive CANADIAN PACIFIC Cruise Entertainment Feature … MEMOGRAMS Pictorial memoranda in the form of illustrated letter sheets; calendars; information sketches of foreign products and strange customs; lecture maps and diagrams; cartoons; entertainment announcements; souvenir postcards and sketches of native types. 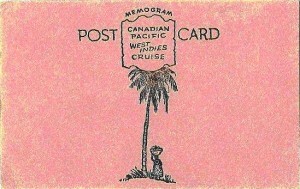 Memogram postcards were produced on board the cruise ship using a stiff card stock available in several colors and distributed to the passengers during the cruise. Cards are known in shades of green (pale green to olive); blue; yellow (almost gold); brown; and a cream (beige) color. All drawing and textual information were sketched in black ink. Long size horizontal oriented views are only found in the cream colored cards while long side vertical views can be found in all colors. All cards measured the standard size, 3.5 inches x 5.5 inches. 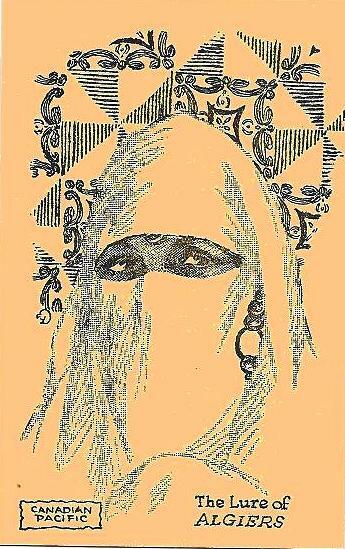 No specific information could be found on the process of taking the sketches and producing the memograms but it appears they must have had a press, cutting and trimming tools, ample supply of black ink, various colors of card stock, paper, and envelopes. 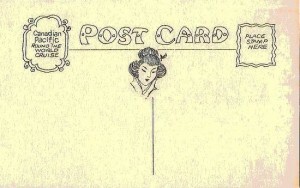 This production of postcards and other memogram was probably performed on almost a daily basis, as many of the memogram announcements were date sensitive. 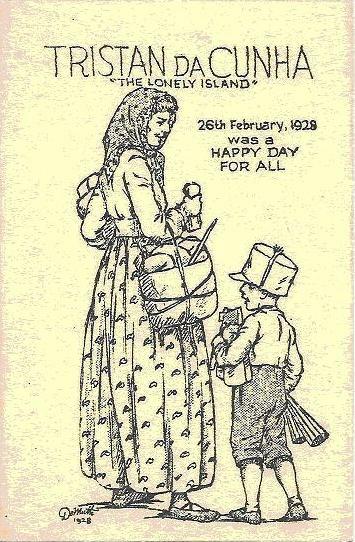 It was important to get the stationery produced and distributed so passengers could use them to mail friends and relatives and post them at ports of call. To my knowledge no printing figures were maintained. This was probably an operation strictly managed by the artists themselves and there was no obvious benefit to keeping records. 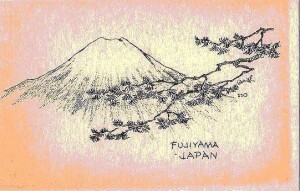 It sometimes can be difficult to determine whether Flora or Martin drew a particular postcard. Sometimes Flora spells her first name out, other times she as a single large capital cursive ‘D’ with an ‘F’ imposed above and to left of the stem of the ‘D’. Most of the time the cards are simply signed ‘DeMuth’. After looking at many memogram stationery items, where Martin has signed his name, I can detect his style of drawing on most cards. 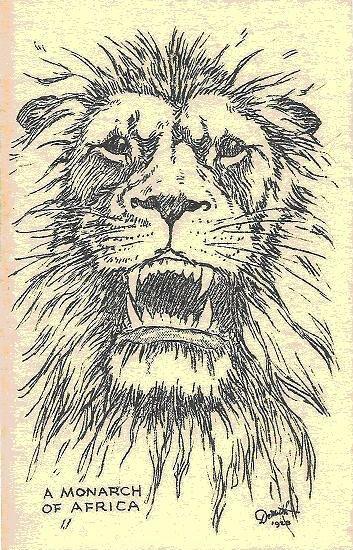 His drawings have less detail, more crudely (not in a negative way) drawn, and often with a humorous theme and text. Although Flora sometimes displayed humor too. On the view side of the earliest produced cards (on board the Empress of Scotland) appear numbers, which seem to be assigned with ascending values according to the chronological order that the route traveled. No other postcard series by the DeMuths contains numbered views. On the ‘Canadian Pacific South America – Africa Cruise’ series, issued aboard the Empress of France, all have the year ‘1928’ on the view side. The postcard images below showing the detail of the subject are typical of Flora DeMuth’s artistic style. 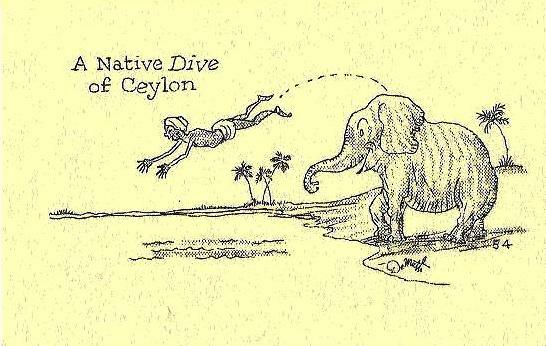 The DeMuths found humor and beauty in the countries they visited. Address (reverse) side varieties were also sketched. 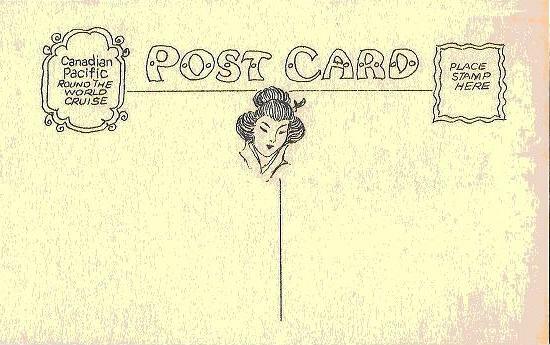 Memogram postcards drawn with a horizontal view. Soon after I accumulated a handful of these postcards and after receiving photocopies of other cards produced by these artists it became apparent that I needed to develop a classification system to assist me in organizing them. After much experimentation I settled on organizing the postcards into groups based on the text on the reverse side describing the cruise. Included in the group are the: ‘Canadian Pacific Round the World Cruise’; ‘Canadian Pacific West Indies Cruise’; ‘Canadian Pacific Mediterranean Cruise’; ‘Canadian Pacific South America-Africa Cruise’; ‘Canadian Pacific Empress of Britain Cruise’; and ‘Canadian Pacific Five Cruises in One’. Within each primary category there exist variations on both view and reverse side. 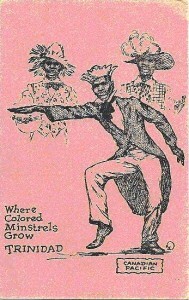 Cards with the same view were sometimes used again years later within the same or different primary category, and possibly in a different color. The following table lists the major category which I have used. Within each cruise category I have a number of secondary categories based on differences on the address side (mostly in either text and/or accompanying drawing). I have noticed that postally used copies are much more difficult to find as they probably also find themselves in the collections of philatelists. Postally used copies help date the usage and may identify (when DeMuth’s text doesn’t indicate) from the sender’s writing what ship they were travelling on. At the time of this writing I have identified over 200 varieties. New varieties surface occasionally. In addition to the references listed after the biographical section of this article I want to acknowledge the contributions from several whom I have corresponded (chronologically): Jo-Anne Colby (Canadian Pacific Archives); Francelia C. Johnson (Kent, Conn.); Bill Buchanan and Wayne Curtis (members of the Toronto Post Card Club); and Pat DeMuth (DeMuth yahoo group). Flora Nash was born September 7, 1888 in Harford, Pennsylvania (one source quotes Foster, Penn.) She was the youngest of five children. She spent her childhood on a farm, drawing animals and pets of the farm and woodlands. When nearly ten, her family moved to Binghampton, New York. She attended high school there where her artistic abilities began to flourish. After high school she attended Syracuse University and later became a head of an art department at a business agency in Rochester. Finally, she moved to New York to study at the Art Students’ League. She was elected to the New York Society of Illustrators. Her studies continued with several notable artists of the time, including Robert Nisbet, who first turned her skill to the field of etching. Martin DeMuth was born on April 16, 1885, in Cardington, Ohio. His family moved to Oregon when he was young, where he completed his high school education in Portland. In high school he excelled in writing and cartooning – which won him recognition. After a diversified education at the Arts Students League of New York, San Francisco Institute of Art, and the University of California he enlisted in U.S. Army as an infantry officer, retiring as captain at the end of World War I. He continued his art interests enrolling at Columbia University and later the Federal School of Commercial Art, a correspondence school based in Minneapolis. In 1923, Martin was assigned to the Recruiting Publicity Bureau, Governors Island, New York, where he became an assistant editor for the Recruiting News, authoring many of his own articles and illustrating them himself. The War Department sent him on a unique sketching tour to Far Eastern stations of the Army, Navy, and Marine Corps where his mission entailed much exploration of native customs of China, Japan, the Philippines, and Malaya. He spent a year in the Orient doing his work to inspire new recruits. Near his station, he could see the palatial cruising liner and there his dreams of travelling around the world spawned a plan for mixing his avocation with pleasure. After he returned to New York he met Flora Nash. In 1926, Flora Nash married Martin DeMuth, a roving artist who just returned from the Orient where he was on assignment for the US War Department. 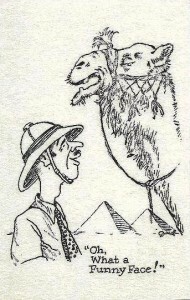 While in the Orient, he had originated a plan for illustrating, aboard ship, the commercial world cruises. The DeMuths sold their plan to the Canadian Pacific Steamships, From their first world cruise (aboard the Empress of Scotland) grew fourteen years of worldwide sketching in a sea-going studio. It was disrupted by the beginning of World War II, when carefree travel ended and the military sequestered the cruise ships and fitted them for transporting military personnel. 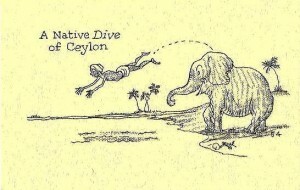 The DeMuths returned to their home in Kent, Connecticut where Flora Nash began a successful career illustrating children’s books while Martin took trips to Mexico and Cuba to sketch. He was also an illustrator and letterer for some comic publications. Martin died March 2, 1961, in South Kent, Connecticut after a short illness. Following Martin’s death Flora moved to Hawaii, where she became active in the Honolulu Art Association and the American Pen Women. She also executed the Stations of the Cross for St. Roch’s Catholic Church in Kahuku. She passed away August 2, 1976. Illustrator of Children’s Books (1945-56). Compiled by Ruth Hill Viguers, Marcia Dalphin, and Bertha Mahoney Miller, Boston, Horn Book, 1958. 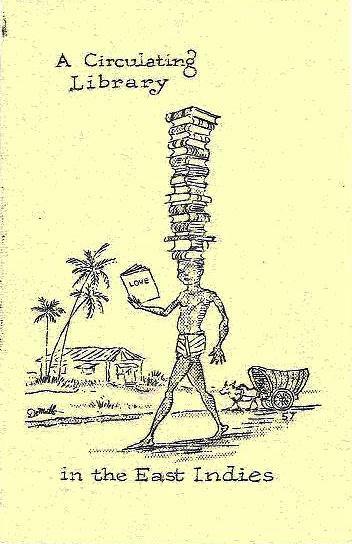 (IlsCB 1946). Biography Index 0 Vol.5, Sept, 1958 – Aug 1961, edited by Joseph Bea, NY: H.W. Wilson Co. 1962 (Bioln 5) – just cites illustrator of Children’s Books. American Art Annual: Who’s who in Art, Biographies of American Artists from 1890-1946, edited by Peter Hastings Falk, CT. Second View Press, 1985. Bridgeport, Connecticut Post, August 22, 1951. Honolulu Advertiser, August 4, 1976, obituaries. Volcanito, A Fairy Tale of Today by Flora DeMuth, Vantage Press, 1969. The Kent Art Association 1923-1950, published by Kent Art Association, 1950. In Their Own Words, 1927, Federal School of Commerical Art, Minneapolis. Error: Error validating access token: Session has expired on Friday, 12-Apr-19 20:21:58 PDT. The current time is Friday, 19-Apr-19 21:17:41 PDT.